Hank's Oyster Bar will be launching their newest location at The Wharf, and owner Jamie Leeds could not be more thrilled to have her first seafood restaurant actually on the water! Her cheerful marketing team served up lobster rolls at the taxi preview, from left, Shane Mayson, Sabrina Zahid and Erin Lucas. The Wharf may have felt like it was a long time coming, but the results are worth it. A tour of the new development from the water today was a great way to understand the enormity of the project, its design as a entertainment destination and just how much new access to the water DMV residents will have when it fully opens. Think large scale; there is almost a mile of promenade for walking, sitting, shopping and eating. Twenty new restaurants, from casual to fine dining will help on the eating front and four public piers will provide access to the water by paddleboarding, kayaking and even room for docking boats. The developers envision activating the piers with fitness classes and yoga, as well as performers and musicians. And yes, the completed buildings hold today's urban neighborhood blend of office, residential, retail space and three hotels. We noticed a new Politics and Prose bookstore (yay!) and lots of other interesting small shops like District Hardware, Harper McCaw chocolate and a new version of the iconic fish market. We've been eagerly awaiting Fabio and Maria Trabocchi's Del Mar, and well as the Italian Market by Nick Stefanelli. Other restaurants scheduled to open soon are Mike Isabella and Jennifer Carroll's Requin, Belgian restaurant Florentijn owned by former Belgian embassy chef Jan Van Haute, Kaliwa by Cathal Armstrong, Mi Vida by Roberto Santibañez, Hank’s Oyster Bar, La Vie, Potomac Distilling Company’s Rum Distillery and our second outpost of Rappahannock Oyster Bar. The Wharf will give DC new access to the waterfront for entertainment, living and working. By the numbers there are 1,375 residences, 800 hotel rooms, 335,000 sq. ft. of restaurant and retail space, 945,000 sq. feet of office space, and a 6,000 seat new concert venue. And, 2,500 underground parking spaces. Not enough to do, right? The owners of the 9:30 Club are opening The Anthem, a concerts and events venue with a capacity of up to 6,000. DC Mayor Muriel Bowser was on hand to talk to the press and take a ride at the launch of the Water Taxi service from the new transportation pier at The Wharf. 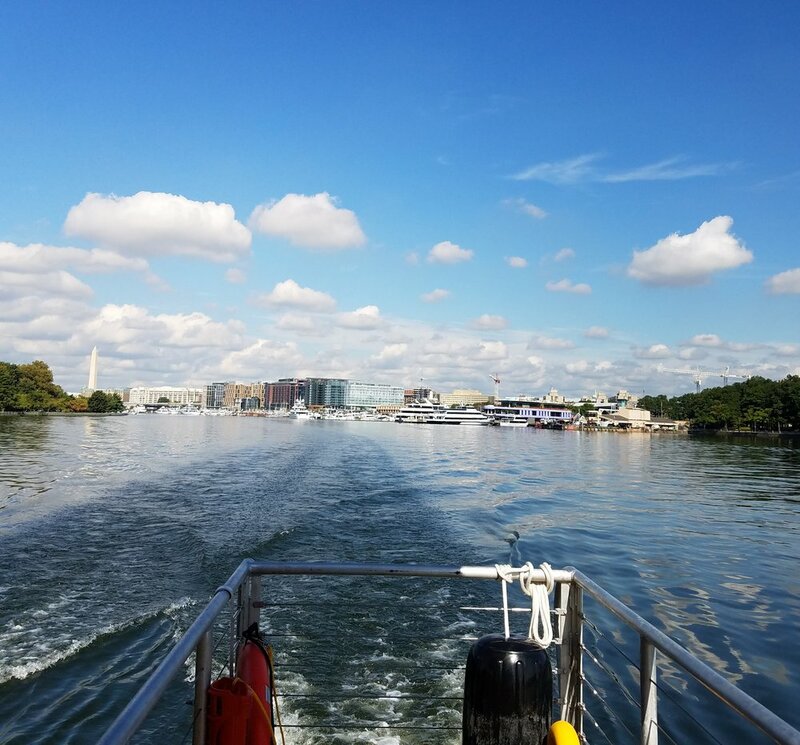 The Water Taxi will leave from the Transit Pier and connect The Wharf to Georgetown and Alexandrian, and in 2018 will also go to National Harbor. We're so happy to see the water taxi employed to use the river as a transportation resource. You can enjoy the ride, take in the view and skip the road traffic. And even more good news that will help give access to one of DC's gems: A smaller jitney (it's free!) will make runs to always lovely Hains Point for picnicking, walking and biking. A view of The Wharf from the water taxi as it cruised towards Alexandria.